Artist and musician Brian Eno once said that he wants to live in a “big here” and a “long now.” How long is your now? That is to say – what’s the timeframe in which you view our day to day? What timescale informs your decisions? Days? Months? Centuries? In 01996, the LongNow Foundation (named by Eno) formed to “provide a counterpoint to today’s accelerating culture and [to] help make long-term thinking more common.” They define they now – the longnow – as the last 10 000 years and the next 10 000 years. 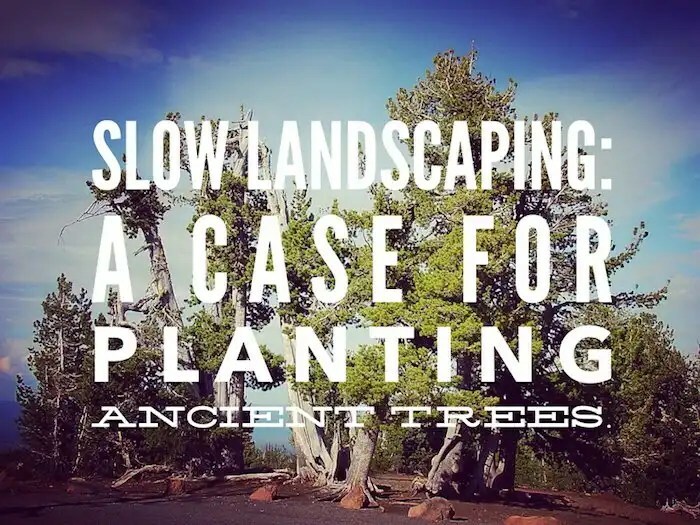 The point of slow landscaping is to provide continuity in a fast-paced environment – to provide pause and contemplation – to remind us that we are the result of circumstances that extends way before (and after) us – that we’re living in the LongNow. Slow landscaping asks us to act in ways – and is an act in and of itself – that leaves future generations with more options than we inherited. One of three bristlecone pine species, P. aristata, can be found at local nurseries here in Edmonton and is a small to medium-sized tree (20 feet tall and 25 feet wide) native to the Blackhills of Colorado. I know of at least one bristlecone pine growing at the Goerge Pegg Botanic Garden near Glenevis, Alberta (an hour West of Edmonton). Read more about this bristlecone pine at conifers.org. Native to the high elevations of Alberta’s mountains, the whitebark pine is a long living Alberta tree with significant ecological value for wildlife (having coevolved with local nuthatches who bury and inadvertently propagate seeds. Like the Korean Pinenut, the seeds are edible, though, smaller. The Whitebark pine is slow growing and can take on various forms depending on the harshness of its location. At high elevations, it sometimes grows as a multi-stemmed shrub but has the potential to get as large as 70 feet tall and 45 feet wide in more favorable conditions. The oldest recorded tree is 1200 years old. The Whitebark Pine is currently a species under threat due to white pine blister rust, mountain pine beetle, and the ill effects of fire suppression. The most comprehensive sources of information on Whitebark pine that I could find is an Alberta Conservation Association report from 2007 and a profile on conifers.org.